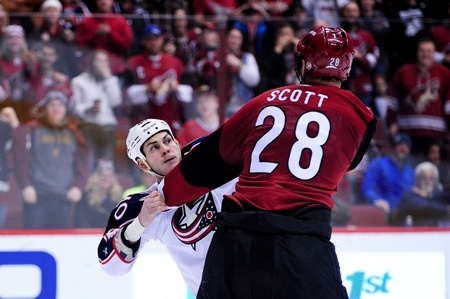 The Montreal Canadiens have acquired All-Star forward John Scott along with defenceman Victor Bartley in a trade that saw them send defenceman Jarred Tinordi and prospect Stefan Fournier to the Arizona Coyotes. The Coyotes acquired Bartley in a deal with the Nashville Predators, with Arizona shuffling defenceman Stefan Elliott to Music City. This isn’t a big money deal by any extent, but there is a lot of movement here. And it’s not every day an All-Star captain is involved in a trade, even if that All-Star captain is a guy like John Scott. On paper, the Coyotes are the clear winners here. Tinordi has played parts of four games with the Canadiens after they selected him 22nd overall in the 2010 NHL Entry Draft. At 6’6, 225 pounds, the Minnesota-born blueliner is a size player with shutdown capabilities. He’s a born leader, even if he lacks point-production skills and will never find himself quarterbacking the power play. But the Habs struggled to find a spot for him on the roster. As for Scott, he’s got an assist in 11 games this season in Arizona and was assigned to the AHL on Wednesday after fans elected him the captain of the Pacific Division at the upcoming All-Star Game. The NHL will have to evaluate how this impacts that decision, what with Scott no longer in the Pacific Division. And the Habs have already lined Scott up to head to the AHL, too, which means he won’t be eligible to head up the All-Star Game. When you consider that the league and the Coyotes had previously asked Scott to “bow out” of the All-Star Game, this trade seems a remedy for that tricky situation. The NHL has always had an issue with the “optics” of an enforcer winning out in fan voting, in case that wasn’t obvious.